Learn about participation in the Deferred Action for Childhood Arrivals (DACA) program nationally and by state, as well as by top countries of origin. The two data tools offered here provide the numbers of DACA recipients at U.S. and state levels and offer an estimate of participation rates as of August 31, 2018, by geography as well as by country of origin. 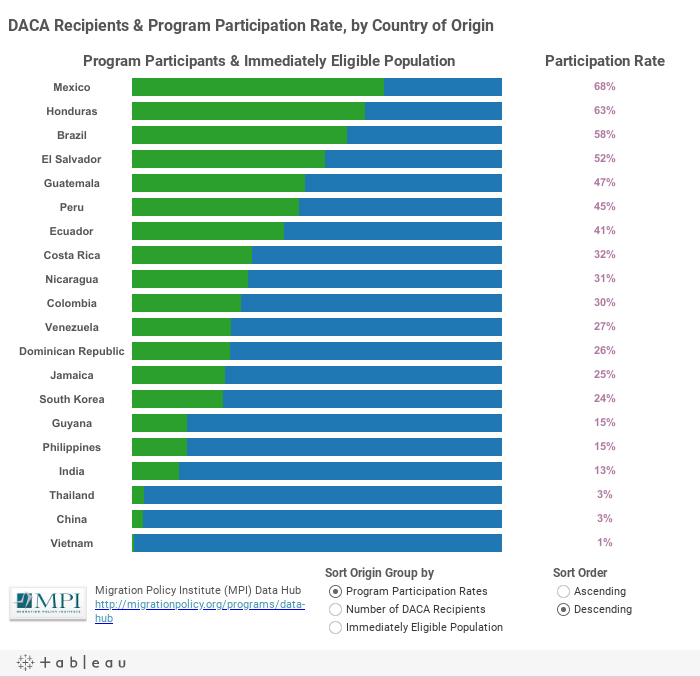 The first tool offers DACA recipient numbers at U.S. and state levels, as well as MPI's estimates of the overall participation rate. The second tool displays MPI's estimates of the participation rate for the top origin countries.  Hover over a state or country to see the data. For notes and sources, please see below second data tool. Migration Policy Institute (MPI) estimates of the DACA immediately eligible population as of 2018 include unauthorized immigrant youth who had been in the United States since 2007, were under the age of 16 at the time of their arrival in the United States, and were under the age of 31 as of 2012. Immediately eligible youth met both age and educational criteria (i.e., they were ages 15 to 34 in 2018 and were either enrolled in school or had at least a high school diploma or equivalent). To capture the population eligible to apply as of 2018 based on the 2016 data source, MPI “aged in” the otherwise eligible 13- and 14-year-olds in 2016 assuming they remain enrolled in school. In the meantime, using the percent of the DACA-eligible population ages 19 to 24 without a GED or high school diploma and not enrolled in school in 2016, a portion of the immediately eligible 15- and 16-year-olds in 2016 was excluded from the group to account for potential dropouts as this population ages. Eligibility due to adult-education program enrollment and ineligibility due to criminal history or lack of continuous U.S. presence were not modeled due to lack of data. The program participation rate refers to the share of the immediately eligible population who were current DACA recipients as of August 31, 2018. The 20 national-origin groups included in the tool were selected based on a combination of factors including estimated population size, sample size, and the availability of application data from U.S. Citizenship and Immigration Services (USCIS). Totals may not add up due to rounding. Percentages are calculated based on unrounded numbers and may not match those calculated based on rounded numbers. Sources: Migration Policy Institute (MPI) analysis of U.S. Census Bureau data from the 2012-16 American Community Survey (ACS) pooled, and the 2008 Survey of Income and Program Participation (SIPP), with legal status assignments by James Bachmeier and Colin Hammar of Temple University and Jennifer Van Hook of The Pennsylvania State University, Population Research Institute; U.S. Citizenship and Immigration Services (USCIS), “Approximate Active DACA Recipients as of August 31, 2018," www.uscis.gov/sites/default/files/USCIS/Resources/Reports%20and%20Studies/Immigration%20Forms%20Data/All%20Form%20Types/DACA/DACA_Population_Data_August_31_2018.pdf. James Bachmeier and Colin Hammar at Temple University analyzed the data on legal status of immigrants that provide the basis for these estimates. Jennifer Van Hook at The Pennsylvania State University advised in developing the methodology. The Data Hub showcases the most current national and state-level demographic, social, and economic facts about immigrants to the U.S.; as well as stock, flow, citizenship, net migration, and historical data for countries in Europe, North America, and beyond. Contact the Data Hub manager at data@migrationpolicy.org. In 2012, the Obama administration launched the Deferred Action for Childhood Arrivals (DACA) program that provides a temporary reprieve from deportation to qualified unauthorized immigrants who came to the United States as children. The research here offers a demographic portrait of this population, and examines congressional consideration of the DREAM Act, and issues arising in the debate over the future for DREAMers. Want the latest estimates and characteristics of unauthorized immigrants in the United States, including those potentially eligible for relief from deportation? Use this innovative data tool to get population estimates and much more—including countries of origin, recency of arrival, educational enrollment and attainment, industries of employment, incomes, English proficiency, and health care coverage—at the national level, by state, and for top counties. Learn about top state and county destinations for unauthorized immigrants in the United States based on their country or region of origin in this interactive map.